“Mail carrier” was recently named as one of the 10 worst careers in the U.S., largely because of a supposedly bleak employment outlook. CareerCast’s jobs outlook was based on a U.S. Labor Department projection that the number of mail carriers would shrink by 28% from 2012 to 2022. That’s no surprise: Just about everyone knows that digital technology is making letter carriers an endangered species. There’s just one problem with this scenario: “Just about everyone” is wrong. The number of people delivering mail for the U.S. Postal Service is actually growing slightly. It’s true that since the end of 2012, the number of career USPS employees involved in mail delivery has dipped slightly, from 243,000 to 237,000. But the shrinkage all occurred during 2013; recent statistics show the number has stabilized or is rising slightly. And when non-career employees like city carrier assistants (CCAs), are included, mail delivery looks like a growth field. 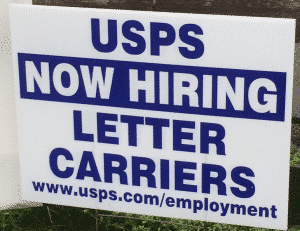 That, plus the high turnover among CCAs, is why “We’re hiring!” signs are popping up at many post offices. USPS statistics don’t provide apples-to-apples comparisons of non-career employee counts, but the numbers on hours worked are a good proxy. So far this year, the straight-time hours worked by all (both career and non-career) “city delivery carriers” are up 5% from two years ago, while the hours for all “rural carriers” have increased nearly 3%. Read more: Dead Tree Edition: Why Letter Carriers Are Not an Endangered Species. 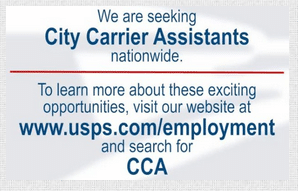 This entry was posted in City Carrier Business, Downsizing USPS, General Union Business, Transfers/Vacancies and tagged 2015 Jobs Rated Report, career employees, CareerCast, CCAs, city carrier assistants, hiring, letter carriers, mail carrier, Non-career employees. Bookmark the permalink.